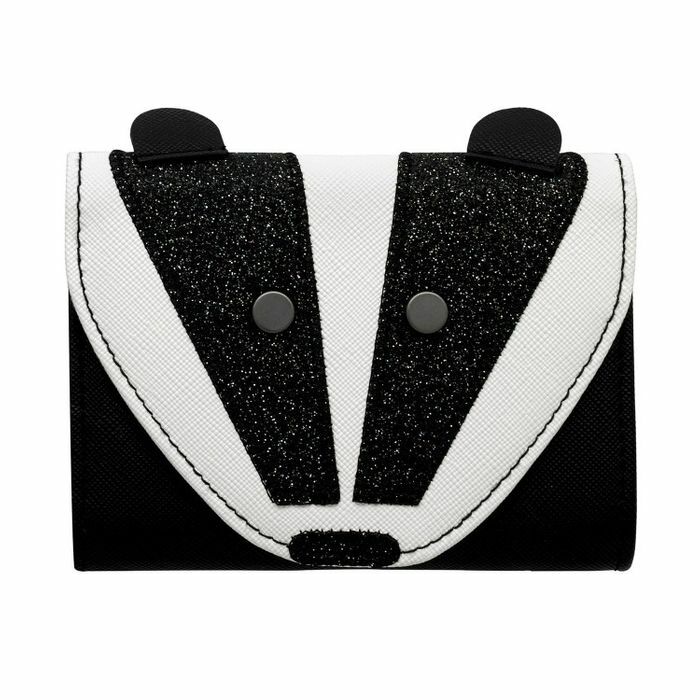 Add an adorable touch to your accessory collection with this little Badger shaped purse from Cath Kidston, complete with a black glittery face and tiny, grey button eyes. Made from faux leather with a cross hatch texture, it has a fold over front flap that secures with a push popper to keep the contents safe. The inside, which is lined with Cath’s Badgers and Friends print in colourful tones, has a zipped section for coins and two slip compartments for notes and tickets. Perfect for women of all ages, this could also be used to take jewellery away with you or to store hair accessories in! It would make a brilliant birthday, Christmas or Mother’s Day gift for any who loves Cath’s designs as much as they love animals! This adorable design from Cath Kidston combines soft and bold colours with vintage inspired imagery to create a print with a mystical feel to it. Illustrated in green leaves and contrasting, red flowers, woodland animals are pictured in tones of grey and cream. The monochrome colour pallet blended with the pop of bright yellow and red from the petals puts a modern twist on the design, giving it a contemporary feel. Cath Kidston opened her first shop in West London in 1993. More than 20 years later the brand she founded is famous around the world for its original prints and fresh, modern take on vintage English style. At their London studio, the design team create new prints every season for a wide range of cheerful, practical products to help brighten up your day! Aww this is so cute and would make a great gift for a child or adult fans of badgers! Half price makes it definitely worth a chance in the hope I find a badger fanatic.